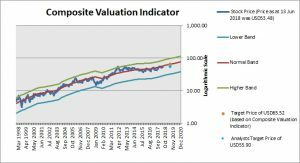 Stock trading at attractive valuations despite the strong fundamentals. When we look at the financial performance of Fastenal, we can’t help but conclude that it is a solid company. 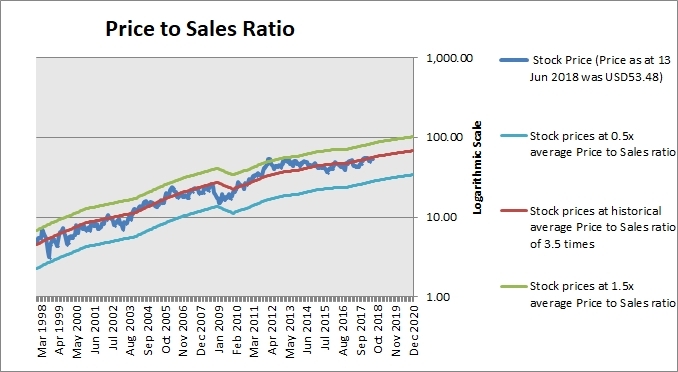 Over the last 20 years, Fastenal has registered positive profit growth in all years except for extreme periods, namely the dot.com bubble burst and the global financial crisis. 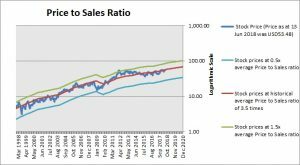 (Please see the Price to Earnings Ratio chart below.) As in any business that is exposed to the industrial cycle, Fastenal is exposed to the risk of an industrial slowdown, which affects demand from its industrial customers. 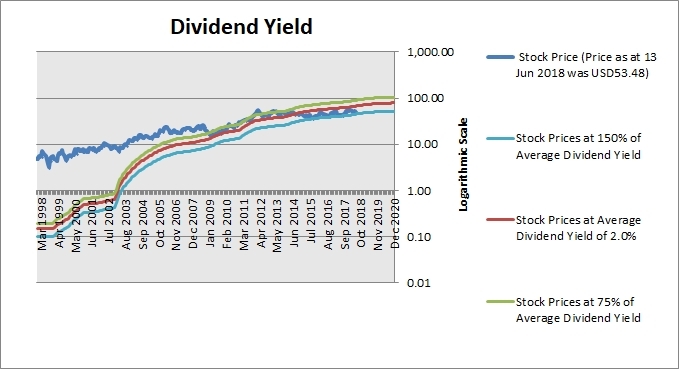 The company is a stable dividend payer, having paid dividends every single year since 1991. It is prudent in growing its business primarily with internally-generated cash and the number of shares through the years have not increased. One of its secrets to its ability to grow its business steadily through the years is its provision of products and services through multiple channels. These include their 2,383 branches, 605 onsite locations (“branch” within customers’ facilities), and 71,000 vending machines. Despite the company offering common industrial products, its margins are commendable. 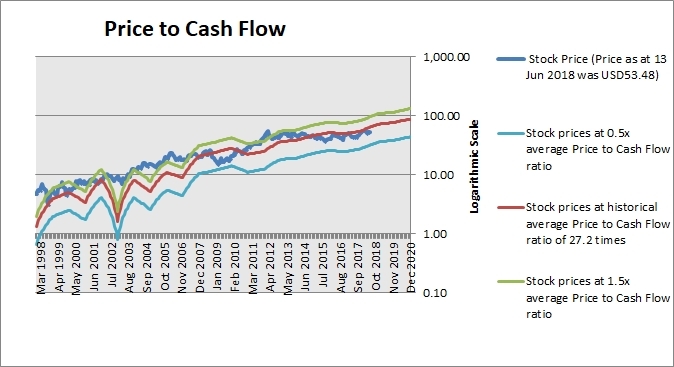 Net profit margins are around 13% and this has even improved from 10 years ago. We believe the company’s efforts beyond just selling products has something to do with these healthy margins. And there is potential for margins to improve even further in the next few years. As the company continues to grow its revenue, it expects to reap the benefits of economies of scale. Fastenal helps its customers to unlock productivity and profits through close collaboration between the company’s dedicated team and its customers. These value-added services may include a site evaluation within the customer’s facility to gain a deeper understanding of its operations in order to uncover waste and improve efficiency. Furthermore, it does not just offer standard products; it is able to customize its products to solve customers’ problems. At the price of USD53.63 as at 04 Jun 2018, Fastenal Co is trading at a Price to Sales Ratio of 3.3 times last 12 months sales. This is a 4.0% discount to its historical average Price to Sales Ratio of 3.5 times. At the price of USD53.63 as at 04 Jun 2018, Fastenal Co is trading at a Price to Cash Flow Ratio of 23.0 times last 12 months cash flow. 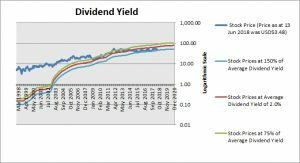 This is a 15.0% discount to its historical average Price to Cash Flow Ratio of 27.2 times. At the price of USD53.63 as at 04 Jun 2018, Fastenal Co is trading at a Price to Book Ratio of 6.9 times current book value. 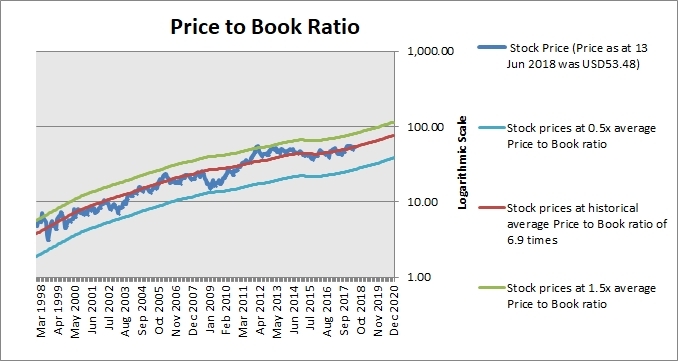 This is a 0% discount to its historical average Price to Book Ratio of 6.9 times. 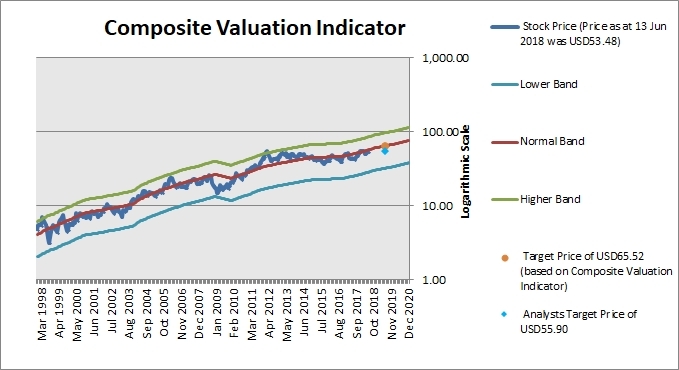 Based on the Composite Valuation Indicator, the stock has a Target Price of USD65.44 within the next 12 months. Our Target Price represents upside of 22.0% based on stock price of USD53.63 as at 04 Jun 2018. To be conservative, we recommend taking profit in the 18% to 20% range. We believe that Fastenal is a well-run company that has proven itself to be a solid and consistent performer. It differentiates itself from being a mere supplier of industrial products to one that actually adds value to customers’ business and help them increase productivity and reduce costs. The stock also looks attractive on a valuation basis using a thorough valuation methodology that combines five valuation indicators in an optimal way to best explain the stock price.